Cocktail Cards! or, Everybody Loves a Giveaway. To celebrate the launch of the new CalamityJennie site, we’re having our first ever GIVEAWAY! And it can be yours for the very low price of FREE. Nothing says “I’m sophisticated” like a “Signature Cocktail”. Think outside of the box of wine or can of beer and step into sophistication with a Signature Cocktail. Beyond the traditional and standard order, Cocktail Cards provide you with a drink idea that is tailored to the season. 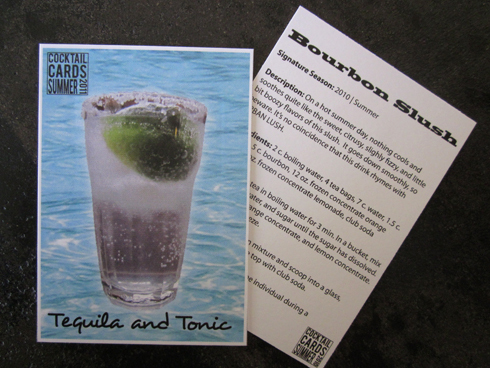 This set includes two Signature Cocktail Cards that are perfect for the Summer Season – Bourbon Slush (Summer 2010) and Tequila and Tonic (Summer 2011). You don’t need to decide which is right for you, because you’ll get both! Sized just like a baseball card, each card features a glamour shot of the cocktail, with all of the stats and figures printed on the back. Each card is placed in a protective sleeve that should help you from ruining it the first time you accidentally use it as a coaster (Side note: not safe to use as a coaster, even in the sleeve). Q: I don’t get it. What are you talking about? A: You’ve never heard of drink recipes printed in a handy baseball card size, that are suitable for trading, even though no one else has any for which you could actually trade? Huh. Q: Will you just send me the drinks instead of the cards? A: No, I will not. The ice would never hold up. Q: What if I don’t like the drinks? A: Ha ha, that’s funny. 1. I will not sell or distribute your name on any sort of black market mailing list subscription service, no matter what they offer me to do so. Unless it is super good, in which case I’ll at least think about it before declining. 2. I will not toilet paper your yard even though I’ll have your address, and it would be super easy. 3. I will not send you other things you did not request, such as Hair Club for Men videos. Not that I’ve ever done that (except for that one summer). 4. For as long as I’m able, or as long as my interest in this project holds out, I’ll keep sending you new Cocktail Cards featuring that season’s signature drink. If you want out, just email me to let me know. No sweat. *Please note: Limited quantities available, much like my attention span.